At Snyder Park in Washington, Indiana, a standalone AMA 250/500 Pro Motocross National took place, and the winners were Bultaco rider Gary Bailey (250) and CZ rider Wyman Priddy. Bailey, who hailed from Torrance, California, beat Arkansas CZ rider Tony Wynn and Michigan's John Borg, who was also on a Bultaco. In the 500 Class, Priddy beat fellow CZ rider Barry Higgins, who had won the first two nationals of the series but then sat out the West Coast rounds, and James Jerles from Zanesville, Ohio. A lot of the top riders in the series—Brad Lackey, Gary Jones, Jimmy Weinert, Gunnar Lindstrom—did not make the trip east for the Indiana round, electing to stay on the West Coast and prepare for the Inter-Am Series that would begin soon in Boise, Idaho. 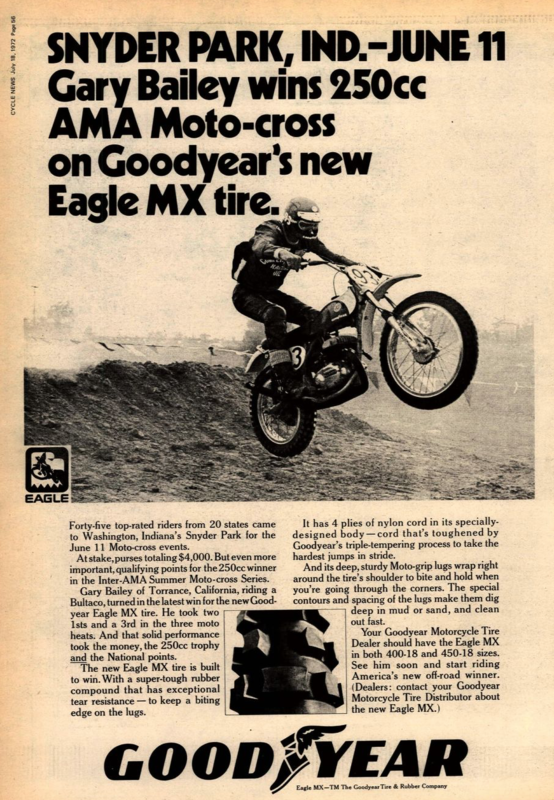 Meanwhile, out at Laguna Seca in Northern California, "Bad" Brad Lackey was the big winner in the CMC North Motocross race that also included the Grossi brothers and Maico rider Gary Chaplin. At the time, Lackey, a Kawasaki test rider, was riding his "CLR" Jawa 250, which stood for Cranke Lackey Replica, as he did not have the Kawasaki prototype 490 at his disposal. He was also the points leader for the 500 Nationals that were taking place back in Indiana! 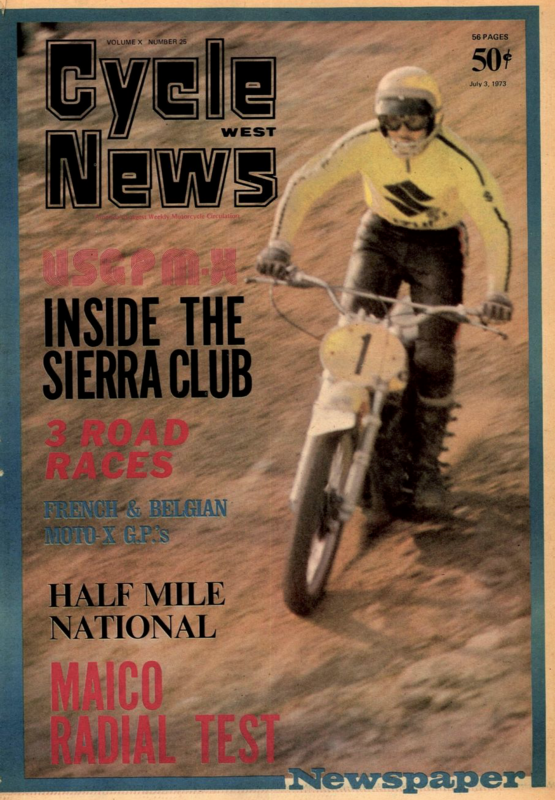 And we missed two things from yesterday, June 10: Roger DeCoster on the cover of Cycle News and a look at the big hill at from the National in Laurelville, Ohio, at the Cycle Trails Moto Park that almost caused the AMA to take it out of the track, only to have the riders almost boycott the race because the rest of the track was so easy. AMA official John "Lightbrown" Lancione relented and, after a little bit of dozer work that would make it a little safer (as well as some chainsaw work up top that would make it wider), the hill stayed in—especially after Team Honda's Gary Jones rode up it to show how simple it was! Over in Czechoslovakia in the FIM 500cc Grand Prix, Husqvarna rider Heikki Mikkola was the overall winner, with Yamaha rider Jaak Van Velthoven second and Maico rider Are Jonsson third. Honda rider Tommy Croft and Marty Smith went 1-2 in the AMA 500 National at Sears Point, with Yamaha riders Mike Bell and "Rocket" Rex Staten following. Yamaha factory rider Rick Burgett won the second moto but was a DNF in the first moto. And in the 250 Class, Bob "Hurricane" Hannah continued his dominance with another win on his Yamaha, with Kawasaki's Jimmy Weinert second and Honda's Jimmy Ellis third. Also on that day in Germany, Maico rider Hans Maisch won his home FIM 250cc Grand Prix with 1-3 moto scores to the 2-2 of Kawasaki rider Thorlief Hansen. Third overall went to Maico rider and future world champion Neil Hudson. 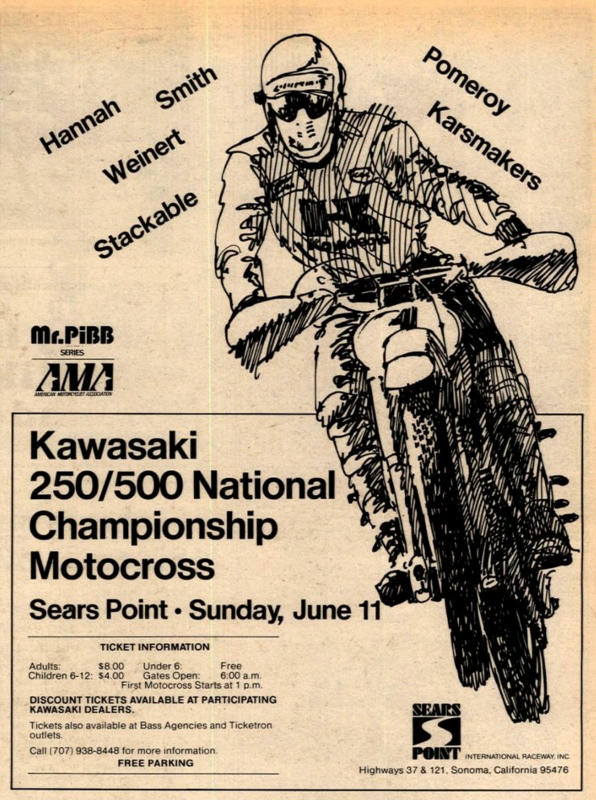 Kawasaki's Ricky Carmichael won his first of what would be a record eight straight 250/450 National wins at Southwick's MX-338 with unlikely 5-1 scores to top the 1-5 of Honda rider Sebastien Tortelli and 2-4 of Suzuki's Robbie Reynard. And Suzuki rider Travis Pastrana was a dominant 1-1 on his RM125 to top the 2-4 of Yamaha of Troy's Stephane Roncada and the 4-3 of Steve Lamson on the TLD Honda CR125. And there was an epic three-way battle between Grant Langston, James Dobb, and Mike Brown for the FIM 125cc Motocross World Championship, but when the series went to San Marino, Husqvarna rider Thomas Traversini took the overall win with 2-1 scores. To follow all of the Grand Prix results from that season, check out out buddy Gilou's amazing Grand Prix results site MeMotocross.fr. You can find results from this race here.